TORONTO (The Sports Xchange) - The Toronto Raptors are best known for their All-Star guards Kyle Lowry and DeMar DeRozan. A major player in the first two games of their first-round series playoff series with the Indiana Pacers, however, has been center Jonas Valanciunas, who has been a work in progress in recent seasons. Valanciunas had with 23 points and grabbed 15 rebounds on Monday and the Raptors defeated the Pacers 98-87 to even the series at one win each. "I was really happy for Jonas," Raptors coach Dwane Casey said. "He got in foul trouble on Saturday. He gave us what we wanted him to give us. ...but again it was a team effort." The victory ended a string of seven straight playoff losses by the Raptors dating to the 2014 first round. Valanciunas scored 12 points and nabbed 19 rebounds before fouling out in Indiana's win in the first game. "They just made more plays," Pacers coach Frank Vogel said. "Their bench obviously had a strong impact. They dominated the paint and we didn't get enough of an offensive rhythm in the second half, but there were a lot of reasons." Paul George led the Pacers with 28 points. He scored 33 points to lead the Pacers to the win in the opening game. "(Valanciunas) has been huge, literally," George said. "We've been doing a good job on DeMar and Kyle but a third guy has stepped up. He's what has been giving us problems. We've got to figure it out." "I'm just doing my stuff," Valanciunas said. "I'm going out there and battling. ...Let's not get too excited. We still have to win three more games. We have to go out with the same energy in Game 3." 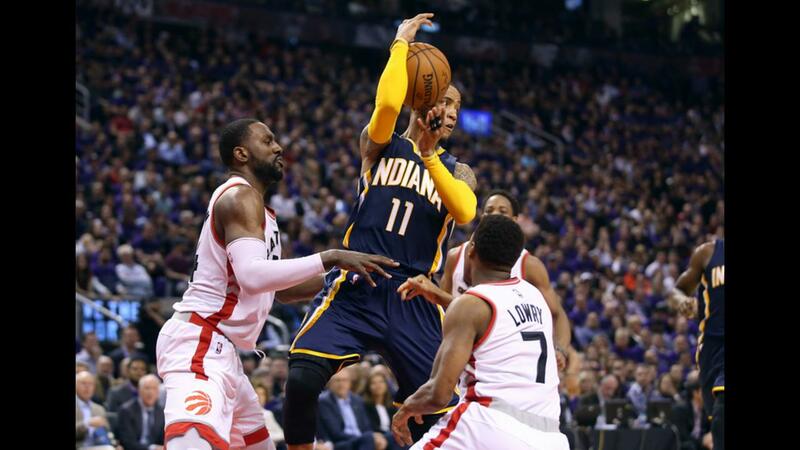 The Raptors led by as many as 18 points in the first half, but the Pacers trimmed that to four during the third quarter, which ended with Toronto leading by eight. The Raptors regained their 18-point lead in the fifth minute of the fourth quarter and had the lead at 19 with less than five minutes to play. Lowry added 18 points and dished out nine assists. DeRozan continues to struggle in the playoffs and did not play in the fourth quarter, finishing with 10 points. Lowry said it started with the defense. "Our defense gets our offense going, it's been like that all season," he said. "P.G. (George) has been phenomenal. He's going to get his points. We just tried to keep throwing fresh bodies at him." Cory Joseph contributed 16 points off the bench, and Patrick Patterson chipped in with 14 points for Toronto. Monta Ellis added 15 points for Indiana. The Raptors started DeMarre Carroll at forward instead of Norman Powell. But Powell soon was in the game after Carroll picked up two fouls in the first three minutes. Carroll finished with two points and Powell scored three. Both played well defensively. "DeMarre came in and gave us that spark defensively and got us started," Casey said. Toronto led 27-16 at the end of the first quarter with Valanciunas leading the way with 13 points and seven rebounds. The Raptors' lead climbed to 18 early in the second quarter. The Pacers trimmed the lead to five when Ellis completed a three-point play with a free throw with 4:41 to play in the half. Toronto took a 53-48 lead into the intermission, as Valanciunas had 19 points and 10 rebounds in the first two quarters. George led Indiana with 13 first-half points and Ellis scored 12. Toronto reserve forward Terrence Ross was kept out of the second half under concussion protocol. He had six points. George cut the Toronto lead to four points on two free throws with 2:43 to play in the third quarter. Joseph made two free throws to close out the third-quarter scoring with Toronto leading 74-66. Lowry made two free throws to bump Toronto's lead to 11 points with 10:11 left in the fourth quarter. He added two more foul shots less than a minute later and the Raptors led by 13. After a Pacers miss, the Raptors came back to score on a reverse layup by Joseph to take a 15-point lead. Bismack Biyombo increase the lead to 18 points when he followed his dunk with a free throw. Lowry made three free throws with 4:19 remaining to increase the lead to 19 points.